Our washing machine has been going on the fritz again. We were beyond lucky that we got the previous homeowner to include the washer and dryer in the sale, but they’re both older Whirlpool models — if I had to guess, the washer is about 20 years old and the dryer around 10-15 years old. Every now and then, the washer does this thing where it won’t spin out all of the water after the rinse cycle. I’ve checked to see if there was a clog in the drain pipe, but that hasn’t been a problem. I’m not overloading the machine, either. I’m going to chalk it up to old age. Whirlpool is a pretty good manufacturer, as far as appliances go — our fridge is also a Whirlpool, and it hasn’t given us any trouble at all (::knock wood::). But we’re going to have to think about buying a new washing machine if this one finally bites the dust. And in true Rainy-Day Saver fashion, I would want to get the best deal out there. There are some brand-name products at bargain-basement prices out there if you know where to look. I tend to favor Sears, since it’s a popular store in our area with a lot of history behind it, and the salespeople tend to be friendlier than those at other places. They usually have great deals at Sears Outlet centers — and I know there’s one near Mr. Saver’s office. Sometimes they run promotions where you can get floor models pretty cheap, so we’ll have to think about that when the time comes. But I’m going to hope that our Whirlpool washer and dryer hold up for a few more years. I’m not ready to put out money for new appliances yet! we had a whirlpool washer, lasted about 15 years with little work done to it. We are probably going to have to buy all new appliances soon as well, I am not looking forward to the expense, but I’d rather buy now sooner-when I know the appliances are on their way out versus waiting until they die. Especially for our 20 year old fridge-that could be expensive! I love the idea of updating appliance, but not the expense. I’ll keep my fingers crossed that you get a great deal when you’re ready to buy! I’ve never been a big fan of Sears. I think they’re overpriced. When we bought our home 6 years ago we needed a fridge and Sears was way overpriced. 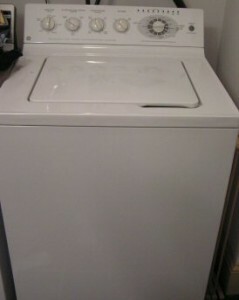 We ended up getting a great deal at Lowes, and we later got a new washing machine there as well. Lowe’s does have a lot of nice appliances — I’ll check it out when the washer finally gives up the ghost! Dunno, there’s an investment most all tend to cheap out on… Dropping a few hundred dollars on an appliance that will get the wear and tear and most likely last 15+ years… I think that is money well spent. Can’t say the same for half the gadgets we willingly spend hundreds of dollars on, just because of the cool factor. @Deb: I agree that you get what you pay for, but sometimes, you can get those better things for a steal! @Ally: I believe it — that’s an incredible price! I’m hoping the washer holds out for a while longer. It’s only holding water once every few months, and re-running the cycle seems to fix it. I’m a big fan of Conn’s. When we moved into our home (a foreclosure sale), it had NOTHING. We were able to get a Whirlpool dishwasher, large Fridgidaire refrigerator, glass-top stove, above-the-stove microwave, and an Estate (Whirlpool’s cheaper brand) washer and dryer set for a total of $2300 with tax. Those were all bought 3 years ago and haven’t had any issues yet *knock on wood*. @Budgeting: I’m sure they loved that you were buying all of those appliances at once, and you got a better deal for it.